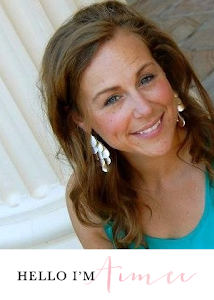 Welcome to the next installment of my house tour, aka my virtual "to do" list. If you're just joining me now you can catch up with the floor plans, laundry nook, guest bedroom, and paint colors. Today I share with you the kitchen. The good news, I actually have some before photos. 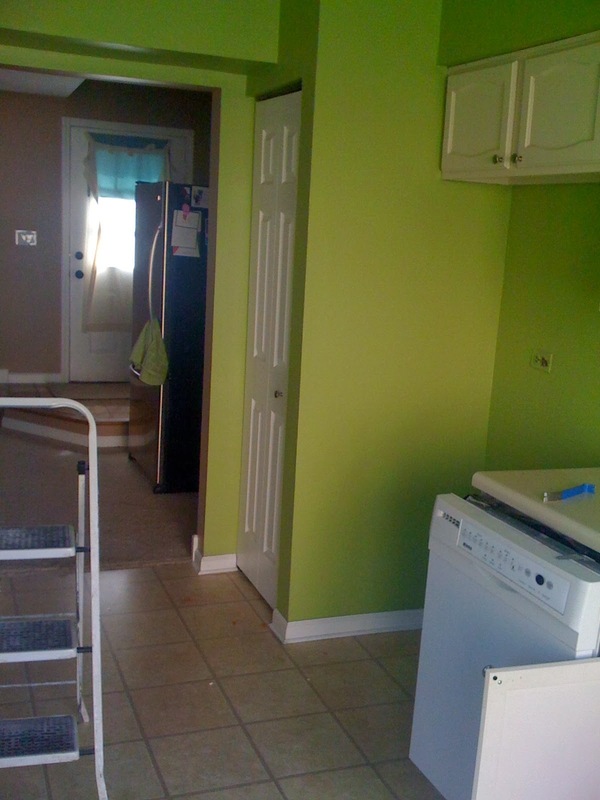 They were taken before the major renovation I did in the summer of 2008, but after I put some new paint on the walls. They originally started a hunter forest green. You can see in trying to brighten the space up I accidentally went with highlighter green. I have no idea what the color actually was, other than not right. The original oak cabinets had been painted a cream color by the previous owners. They were original to the house, short and attached right under the soffit. There was a laminate floor, and laminate counters, all cream. You can see the original oak color of the cabinets above. When I pulled the stove out I discovered that this kitchen was just destined to be green. Not only did I paint it highlighter green, over the forest green that was there. 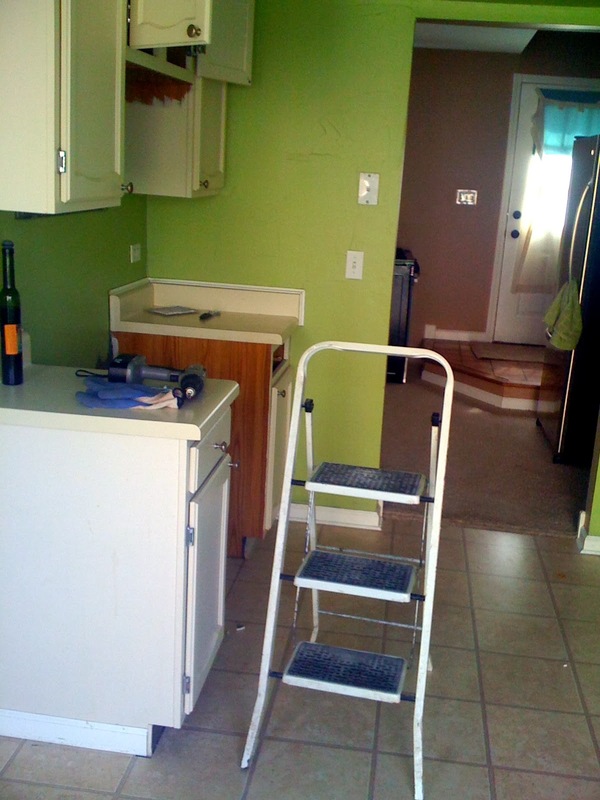 But under the forest green was a sage green, and I planned on keeping it in the green family for the new kitchen. Above you can see all of the soffits as well as the built in pantry closet, all of those were soon to go! 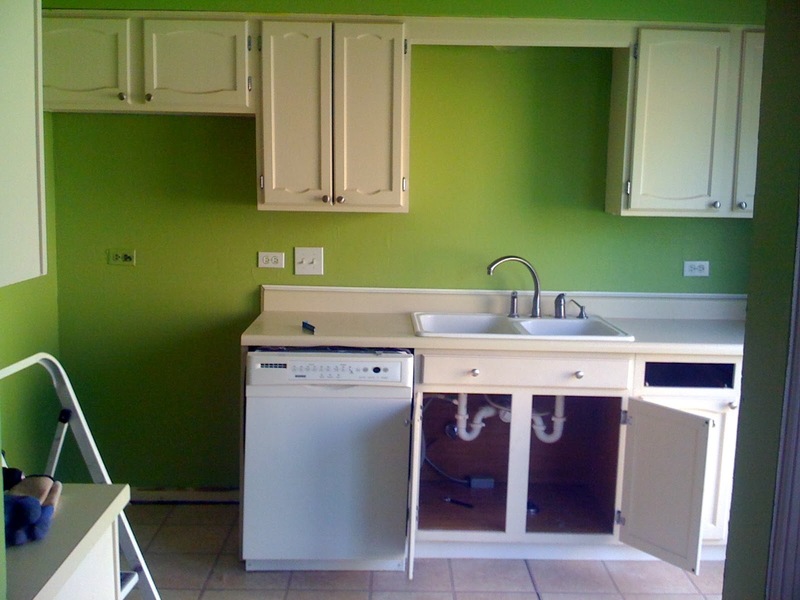 I spent the summer of 2008 redoing the entire kitchen. It is a small space, and unfortunately there wasn't much to change with the layout. First, it was my first huge DIY overall. Second, my budget wasn't huge. I still think demo was the hardest part of the whole thing! The cabinets and appliances came out. The soffits and the pantry got torn down, and the walls got sanded down. The one thing you can't really see in the pictures above is that someone actually added texture to the kitchen walls. Like they took spackle and a knife and just kind threw it on here and there. It was ridiculous. Most of it is now gone, but there are still some spots that look slightly textured. The floors were ripped up, and then it was time to start putting the room back together. The only thing I hired out was the electrical. Once the soffits were down there were a few wires that needed to be moved, and my light over the sink needed to be center. Other then that, it was just us, with the help of Google and You Tube of course! The entire kitchen took about 3 months to complete, seeing as we really only had time to work on it during the weekends. I'm super proud to say, "Hey, I did that!" Ready to see how it turned out?! Ah, so much better! We went with Ikea Adel cabinets. Love them. I always have this fear, even 5 years later, that they are going to fall of the wall. Mainly because I had a part in hanging them up. Good news, they haven't fallen off the wall yet! They are easy to wipe down and I love all the additional features like soft close hinges and drawers. The built in pantry closet was replaced with a pantry cabinet. It is a thousand times more useful. It is fully outfitted with slide out drawers making it easy to store a lot of things and still be able to find them, most importantly! We used a engineered hardwood floor that I found at Lumber Liquidators for super cheap at the time. It does have a red tone to it, but not nearly as red as it shows up in the pictures. The counter tops are quartz, I was able to find a great deal on them at a local home improvement store, Home Owners Bargain Outlet. And for the back splash I just went with your traditional and timeless white subway tiles. This is what you would see if you had your back to the sink. The stove would be to your right, and the dining room is straight ahead. There was nothing on this small wall previously, and I thought I could get a little more storage out of it. The drawers are on casters, so it can move around if needed. I hardly move it around, but it's nice because it accounts for a little more counter space, which there is very little of. The shelves above are hung too close together, someday I will get to moving the lower one down a bit. Aside from the few other to do's that I mentioned there is some ceiling paint touch up that needs to be taken care of, I know the real exciting stuff! As well as making the storage above the fridge prettier. Usually all our bags of chips and snacks end up there, so if I can track down a basket of the perfect size I think that would do. Other than those few things, the kitchen is pretty much complete! Keeping it clean is another story, but that is the good thing about doing this house tour. As I go from room to room it makes me accountable for giving that room a good cleaning, which doesn't happen often enough! I hope you enjoyed seeing my kitchen transformation. I can't wait to have a big spacious kitchen someday, but for now I love that my little one came out looking the way it did, especially for my first real big overhaul!